In Photoshop Elements, when it comes to color, the challenge isn’t understanding color theory or definitions, but matching the RGB color on your computer monitor as closely as possible to your output. Output can be a printout from a color printer or a screen view on a Web page. To match color between your monitor and your output, you need to first calibrate your monitor and then choose a color workspace profile. If you’re interested in sharing photos only onscreen (that is, on Web pages, Flickr, Facebook, Twitter, and so on) and you plan to leave the printing to others, you don’t need to bother with color correction and going through a maze of steps to get the color perfected. The only consideration you need to make is your overall monitor brightness. If your monitor displays images darker or lighter than other computers viewing your images, then you need to understand how to adjust your overall monitor brightness. Your monitor needs to be calibrated to adjust the gamma and brightness, correct any color tints or colorcasts, and generally get your monitor to display, as precisely as possible, accurate colors on your output. You can choose among a few tools to adjust monitor brightness. These tools range from a low-cost hardware device that sells for less than $100 to expensive calibration equipment of $3,000 or more — or you can skip the hardware and use tools provided by Mac OS X or Windows. Gamma is the brightness of midlevel tones in an image. In technical terms, it’s a parameter that describes the shape of the transfer function for one or more stages in an imaging pipeline. You might consider making one valuable purchase for creating a monitor profile: a hardware profiling system. On the low end, some affordable devices go a long way in helping you adjust your monitor brightness and color balance, with prices ranging from $60 to $100 U.S. The best way to find a device that works for you is to search the Internet to find hardware descriptions, dealers, and costs. You’ll find items such as the ColorVision Spyder2express and Pantone Huey Monitor Color Correction, to name just a few. On LCD monitors, you need to adjust the hardware controls to bring your monitor into a match for overall brightness with your photo prints. Be certain to run many test prints and match your prints against your monitor view to make the two as similar as possible. After you adjust your monitor color by using a hardware profiling system, your next step is to choose your color workspace. In Elements, you have a choice between two workspace colors: either sRGB or Adobe RGB (1998). You access your color workspace settings by choosing Edit→Color Settings. Manage colors with the Color Settings dialog box. Always Optimize Colors for Computer Screens: Selecting this option sets your workspace to sRGB. sRGB color is used quite often for viewing images on your monitor. But this workspace often results in the best choice for color printing, too. Many color printers can output all the colors you can see in the sRGB workspace. In addition, many photo services, such as the Kodak EasyShare services, prefer this workspace color. 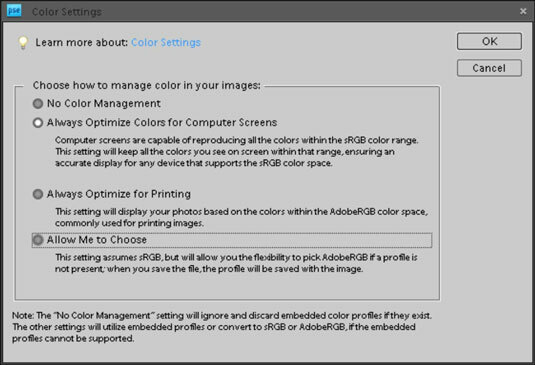 Always Optimize for Printing: Selecting this option sets your color workspace to Adobe RGB (1998). The color in this workspace has more available colors than you can see on your monitor. If you choose this workspace, be certain that your printer is capable of using all the colors in this color space. Allow Me to Choose: When you choose this option, Elements prompts you for a profile assignment when you open images that contain no profile. This setting is handy if you work back and forth between screen and print images.